** ADOPTED!! ** Beevo likes to bounce! He also enjoys rolling in the grass, telling you all about his thoughts and feelings, and has gotten along with other dogs. This funny guy is heartworm negative and looking for his forever home (preferably with a tree or two in the yard…). 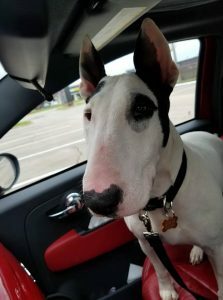 If you are interested in adopting this cow-colored cutie, please submit our adoption application online www.texasbullterrier.org. ← Pop! Goes the Weasel!